Hey guys and welcome back to the blog! Today is that mid week check point. A time to check in on those goals and to motivate yourself to go harder. I usually would like to highlight a person today that I see going hard but I’d like to switch it up and highlight my own brand. Sometimes we don’t give ourselves enough credit and we wait for someone else to do it and sometimes that time never comes. I’ve been working on my brand for quite some time “$elf – Choose You Always” and it derived from self-publishing my first two books in May of 2016, Finding YOUrself – The Road to Self-Love & Discovery and Heartbreaks & Heartaches. I wanted to create a platform for women and young girls to feel comfortable about their ability to love. Being a young woman I know how hard we sometimes try to mask our emotions and depths of feeling. I want us to be comfortable in discussing our heartbreaks so we can get the guidance we need in getting through it. The definition of $elf is; an embodiment of unification among women locally and globally. Self-love is the foundation that sets the love we spread to others. Motivating, Uplifting, and Inspiring all women to rise up and take claim of their thrones and help a sister along the way. One woman can change the world but imagine what a group can do. Rise up Queens. 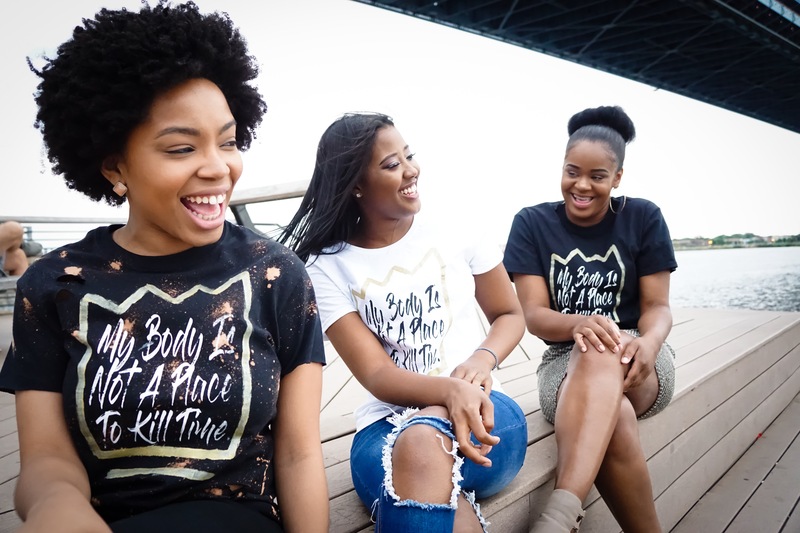 “$elf – choose you always” didn’t come to fruition until earlier this year when I decided to add apparel alongside the books with the slogan “My Body Is Not a Place To Kill Time” which comes from a poem inside of Heartbreaks & Heartaches. I believe deeply in the empowerment of women and providing guidance to ensure we become the best versions of ourselves. My focus has always been Motivation, Inspiration, and Empowerment. Finding YOUrself: The Road to Self-Love & Discovery is a self-help book where I discuss self-love, body love, life & leadership, growth, ways to protect your energy, and give tips on building your own personal brand. All of these things become essential in building healthy relationships. Heartbreaks and Heartaches is where I explore the depths of my emotions and how hard I loved. I give a timeline of my love life and show how even the strongest people can be broken by love. Most importantly I keep it real, I share parts of me that are not visible on the surface. This is my journey of happiness, defeat, and overcoming pain and ultimately my journey of self-love. This is where I learned that self-love is the most important kind of love you can have and that your happiness starts from within. I give relationship advice and advice on building yourself up as a woman and individual. I provide space for readers to self-reflect because self-healing starts with recognizing what the problem actually is. Having a conversation with yourself or writing a letter to someone else can begin the pathway to reaching enlightenment. Self-love is so important to me because I know how it easy it is to lose yourself when dealing with life itself and when loving another person. Self-love is never synonymous to selfishness. It is never selfish to love yourself, take care of yourself, and make sure that your happiness is a priority. Learning to put yourself first is necessary, it’s necessary for your relationships and for your life. You can’t genuinely love someone else until you know what it’s like to love yourself. With this brand I hope to continue to inspire women to love themselves and to treat themselves with the upmost respect. I hope to empower women to be strong and to revel in their ability to love as hard as they do. I hope to encourage women to create a bond within themselves and within other women as well. We spend so much time tearing each other down that it’s long overdue to build each other up. If you are interested in checking out my first two self-published books? Head over to my site: $elf – choose you always. On the site you will find feedback and you will able to take a closer look at the apparel that accompanies the books as well. Take note that there is a Fall Sale currently going on, 20% off orders of $40 or more. I am also working on a third book “The Key To My Brother’s Heart – Kennedy’s Reign” and have posted a snippet be sure to check it out! If you’d like to know more information on how I self-published my books I’d be happy to help. Can’t wait to show you guys what else the brand has in store! Be on the lookout for my self-reflection workbook and journal that’s in the making. Shoutout to all the hard working women! Thank you for reading, Be Blessed & Stay Humble. As always Choose You Always! Say “Yes” To Self – Reflecting!